This is but another evidence that from the first, “Russian ” Christianity was prominently a religion of penitents, penitents who found no difficulty in confessing their grossest sins. This was to mark it with an evangelical character of striking consistency. Of course some distortions arose, distortions so overly penitent that one astute said Russians were incapable of sinning with simplicity. Yet it is easy to see that even behind the distortions lay a candor and humility that moved many spiritually minded Russian people to own Christ’s phrase, “I have come to call not the righteous, but sinners ”—a claim that our over-civilized Christianity may find some difficulty in digesting. Growing out of this penitent spirit is a rich history of spirituality, of Orthodox Slavic believers reaching for the divine with all their hearts, souls, minds and strengths. Here are some of their stories. In Russian lands, as in the ancient East, spirituality early on came to center mainly on monasticism. Monasticism was already in existence in those regions well before the baptism of Kiev, but the royal family’s Christianization certainly lent it a significant boost, as the house of Vladimir abundantly extended its interest and generosity to the Petcherskaia Lavra, or the Monastery of the Caves, whose facility still stands on a much-hallowed plot of ground just outside Kiev. The monastery’s founder, St. Antony, apparently began his monastic life in Greece. But the records of his teaching and practices seem to suggest he was more strongly influenced by Syrian monasticism, especially seen in his insistence on penitential asceticism of a kind we are tempted to regard as inhuman. Born in Lyubech, just north of Kiev, he was unable to settle down in any of the existing monasteries on his return from Greece. After wandering from one to another, he finally established himself in a cave in the side of the hill overlooking the city or Kiev. There, he lived in total solitude on bread and water, digging out his cave with his own hands, watching and praying. Disciples from all sections of society soon gathered ’round him, and proceeded to enlarge the caves and build a church building. He welcomed them, but when there were too many he with drew further up the hill and finished his life in total seclusion. When he died in 1073 (? ), the monastery was under the direction of one of his followers, Theodosius, who was actually canonized as a saint before the retiring Antony was. In the city of Vasilkov, on an unknown date, Theodosius was born to a well-to-do family that moved shortly afterwards to Kursk, north and west of Kiev. His father died when he was about 13, and he was henceforth under the thumb of a mother who is portrayed by Theodosius’s biographer as a veritable virago, whose one passion was to dominate her eldest son. She was horrified when he began to show pity and love for the poor. St. Francis-like, he worked in the fields with the serfs, regularly gave his best clothes to the destitute, and dressed in rags himself. One of his favorite occupations was to bake the bread used for the Eucharistic liturgy. Once he tried to leave home with some pilgrims bound for Jerusalem, but he was caught by his mother, punished, and taken back by force. However, this only increased his longing for a life dedicated to asceticism and prayer. He wore chains under his clothes like the ancient Syrian ascetics, and finally, when his mother was away, ran off to Kiev. There he vainly sought admittance into various ancient monasteries—poor and without recommendation as he was—until at last Antony took him into his caves and gave him a habit. When his mother managed to get on his tracks she went straight to Antony and, affecting anxiety regarding her son, soon melted the good man’s heart. Simple man that he was, he unwisely allowed her to see her son, and once again there was a confrontation scene—though this time her physical roughness was replaced by emotional blackmail. But to no avail. Theodosius gave her no further chance of seeing him unless she herself became a nun in a convent in the city. And, in fact, this is what finally happened. Shortly after Theodosius’s entry into the monastery, Antony, while in principle remaining its spiritual father, went off to a more distant cave and turned the direction of the community over to a monk named Barlaam. But Theodosius soon won the esteem of the other monks, not so much by the rigor of his asceticisms (though he did practice some rather extreme ones) as by his humility; so that, when Barlaam was summoned by the prince of Kiev to govern the monastery of St. Demetrius, the brothers told Antony that they wanted the new recruit as their abbot. Barlaam had already begun to lead the growing community out of the caves by constructing a small church building. Theodosius built a larger one and surrounded it with cells and a cloister. In 1062 the monks transferred to these buildings, and the caves were hardly ever used thereafter, except as places of more or less temporary withdrawal, and finally as tombs. Into the monastery thus transformed, Theodosius introduced a more-moderate monastic rule than the extremely rigorous one that Antony had advocated. But Theodosius did not altogether abandon either rigorous asceticism or the longing for total solitude. Though we are no longer told of the extreme austerities of his youth, it appears that he never slept except seated, and that he returned every Lent to the caves where he had ordered that he should be buried. On the whole, however, monastic life as he lived it found its whole meaning in the ceaseless opportunities it offered for humility closely bound to charity, and for his own personal deprivation for the sake of others. As the Superior of a monastery whose prestige had grown almost overnight, and as one soon to be the intimate of Kievan princes, he nevertheless continued to dress like the poorest of beggars, and was indifferent to the scorn that this provoked. He preached to his community by example rather than by precept. When the cook complained that the brothers had not brought in a fresh supply of wood, it was he who quietly set himself to the task while the others were at table. They were so dismayed, on coming out of the refectory, to see him with a hatchet in his hand and surrounded by logs, that they all soon set to work. But things did not always turn out so well, and it is obvious from reading his exhortations to the brothers that they took things easily where discipline was concerned, knowing that nothing would be said however much they trod on their Superior’s toes. When he heard monks chatting in their cells when they should have been asleep or at prayer, he contented himself with tapping gently on their doors as a warning. And if he summoned them for a reprimand, he would give it by means of a parable that they were quite free to not understand. However, on one point Theodosius was intractable: poverty. If he discovered superfluous provisions anywhere in the monastery, he had them thrown on the fire at once. But for that matter, the pantry steward rarely had opportunity to put much aside, for the monastery was a center of charity where almost everything that come in was promptly given out again. And when this deliberately improvident economy resulted in shortage, we are told that Theodosius solved the situation by an unobtrusive miracle—a gold piece delivered by an angel, for instance . . . . Otherwise he seems to have impressed the brothers especially by the serene continuity of his prayer, and by the way he repelled the assaults of both devils and brigands by the angelic presences he drew to the monastery. An episode in which the saint’s prayer and humility came together with his delightful simplicity occurred once when he was praying in his cell. On hearing someone coming to awaken him he stopped singing and answered only at the third knock, so that the caller might think he had been asleep. That same simplicity characterized his relations with princes. Not only did he receive them without being any more impressed by their splendor than irked by their importunity, but he accepted their invitations with good grace. That did not prevent him from censuring their pagan recreations that he was able to observe on such occasions, nor from boldly denouncing their extortions. When Prince Sviatoslav (one of Prince Vladimir’s descendants) dispossessed his elder brother Isviaslav, Theodosius consented to resume relations with him. But the monk never hid from the usurper that he looked on his brother as the lawful sovereign, and exhorted him to the end to put his brother back on the throne. It’s easy to understand how such a humble-but-straight-forward personality made Theodosius a quickly-popular saint. But his sort of moderate asceticism was to have less influence on the later norms of the Petcherskaia Lavra than St. Antony’s rigorous style did. It seems that the moderation of the Lavra became even more relaxed after Theodosius’s death, triggering a counter-reaction of severe asceticism among his more serious successors, who set their eyes on a return to the extreme disciplines of St. Antony. For example, there was John the Sufferer, who had himself buried alive, and Pimen the Sickly, who was perpetually, intentionally diseased. Another outstanding figure in this ascetic tradition was actually from the time of Theodosius, and set probably the first example of a type of saint that was to become common in Russia: the “fool for Christ. ” This Isaac, so possessed with his battles against devils that he eventually sank into hallucinatory madness, was rescued from this by Theodosius. He thereupon took over the vilest tasks of the kitchen until, when seeing that his brothers regarded him as a saint, he simulated a relapse to defer their praise. In the late 12th century there lived the only monk besides Theodosius of whom we have a biography dating from before the Mongol invasions: St. Abraham of Smolensk, who died in 1221. Like Theodosius, Abraham was initially attracted to monasticism by its vow of poverty. But once a monk he developed a passion for study, and was one of the first preachers and writers of old Russia. It was the Bible that interested him, with such commentaries of the Church Fathers as he could get hold of. And among these the apocryphal writings of the first few centuries A.D. seem to have particularly claimed his attention. Their apocalyptical mysticism fascinated him. His preaching, and his personal prayers, seem to have been dominated by the fear of God’s imminent judgment and an impatient expectation of eternal life. To understand these characteristics and the significance they had for him, we must place them in historical context. Christianity in that day had barely penetrated the pagan masses, and then heretical gnostic ideas, such as a revived Manichaeism, began to mingle with the faith. Against this background, it is not surprising that Abraham’s knowledge and speculations caused him to be suspected of heresy, the jealousy of his unlettered brothers seizing too quickly on what was unusual in his reading and preoccupations. Yet it was a very authentic biblical vein that he had recaptured in his exalted expectation of the Judge and the Savior. His vision of imminent judgment, in fact, gave way to an anticipation of the heavenly city, and a longing for its luminous beauty, to which his taste for the liturgy and for iconography bore equal witness. With St. Abraham it seems clear that the Russian vision of a transfigured world, linked to Christ’ resurrection, was very consciously also that of the world beyond death, as being the only one that could be beyond sin. If we take the Russian Christian’s early fascination with the image of Christ as the humbled servant, together with the moderated asceticism of Theodosius and the apocalyptic thought of Abraham, we cannot avoid being struck by the resounding echoes of the Bible to be heard. It is certain that the Bible, the liturgy, various great ascetic texts, and the apocryphal writings in which the mostly primitive Christianity is expressed, for many years constituted almost the only literary stock of knowledge in this corner of Christendom. Some have said that the peoples in these regions were especially attuned to these “more simple, straightforward approaches to faith ” whatever the reason, it was only slowly and always sporadically that they would be influenced by the more intellectual forms of Greek Christianity. Whether or not we believe there was a particular affinity between the Slav soul and the Bible, this soul was frequently to give a renewed vision of Christianity—one close to the gospel as well as to the prophets—precisely because of this providential concentration on the Bible illumined by the contemplative aspects of the Greek fathers on the Byzantine liturgy, and an instinctive predilection for Syriac patristics. The relationship of the man of God with the prophets of the Bible, in whatever guise the man of God would take in Russia, was to remain striking feature. Whether monks or bishops the Russes’ ancient teachers in the faith all had a freedom of utterance and an inspired and spontaneous mode expression, whether they were addressing common people or princes. This is also illustrated in St. Philip, a metropolitan of Moscow who was martyred in 1569, during the formation the Muscovite Empire. Addressing Ivan the Terrible during a service in the Cathedral of the Dormition, he said: “Sire, we are offering here a bloodless sacrificed while the blood of Christians is flowing behind this sanctuary. ” The angry prince tried to silence him, but he went on, “I cannot keep quiet, for I cannot obey your command rather than God’s. I am fighting for the true and the good, and I shall continue to do so even if I forfeit my dignity and suffer the cruellest wrongs. ” Not long after this the leaders of the Church were throttled by the temporal power in Muscovite Russia, which had become the Third Rome. Ancient Russian spirituality, like its Latin and Byzantine counterparts, was mainly monastic spirituality. Yet it would be a mistake to think that it therefore neglected the problems specific to lay spirituality. In this, Russia was different from the Western Middle Ages, and even the Byzantine Middle Ages, and the reason for this was first and foremost the strongly evangelical direction of at least one part of Russian monasticism since its very beginnings. Just as it had been with primitive monasticism, the monk in Russia was not so much someone who had a vocation apart, as someone who had a particularly intense vocation to fulfill the simple, basic Christian requirements. This was also probably why the layman saw monastic life less as an ideal life, impossible of attainment, than as a positive incentive to transpose into his own conditions the aspiration to be found there at the height of its purity. If we judged by the paucity of penitential books for laymen published in Russia in its earliest years, then we would say this mindset was little present. But actually, it was already so prevalent in the culture that little had to be written about it. The extent of this can be seen in a treatise written by a layman for his own sons, the Admonition of Prince Vladimir Monomach, (r. 1113–1125). Though the reflections of a prince and stamped with his personal experience, it is so deeply meditated that it could easily be applied to all men with professional and family responsibilities. Furthermore, Vladimir shows a deep awareness of the creation, in which we observe something of the age-old poetic depth of the Slav pagan’s soul. But in Vladimir this element is wholly Christianized, in the vein of an entirely biblical thanksgiving. We should be totally mistaken if we imagined that these outbursts of religious lyricism, coming so unexpectedly from a realistic politician and warchief, were some form of emotional compensation sought in a vague aestheticism. On the contrary, the theme of this layman’s religion is the necessity for work, for patient and persevering work and study brought to bear on all the tasks for which he is responsible. Indeed, reversing the dictum to which we are accustomed, he says admirably that prayer has value only in so far as it is a higher form of work. He insists with particular force on the elimination of all pride from the heart, and at least one scholar has noted that Vladimir calls God a terrible judge only in the context of the commandment of love for men. Generosity, not excluding (far from it) firmness, seems to him the essential duty of the prince, with the absence of all avarice that meditation on death should bring about. In the list of lay works that he is always mentioning he includes, naturally, war and hunting. But we should note that he inculcates the duty of avoiding all other killing, and makes no secret of his opposition on principle to capital punishment. It would be difficult to find elsewhere, especially at that time, such a complete and high ideal for the Christian layman. The Mongol/Tartar invasion (1227–1240) produced a general collapse of the political, economic and cultural life of the Russes, especially in the cities where Christianity had known its earliest developments, and where monasteries had been early established. 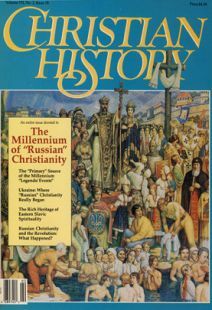 When some form of national life was resumed in the 14th century, centered on the principality of Moscow, the rebirth of religion was closely linked to the rebirth of monasticism. But the monks of this period, at least the most fervent and influential among them, took to leaving the cities and settling in the vast forests of the center the North. This trend has for many years been attributed to the man who was to become the patron of Moscow and all Russia, St. Sergius of Radonezh (d. 1392). In fact this trend was general and spontaneous, with St. Sergius being no more than an outstanding representative of it; but we can study it more readily in Sergius, because a very remarkable biography was written about him soon after his death. He and his followers had apparently been influenced by their contemporaries in Greece, whom they resembled not only in their taste for solitude but in the intensity of their inner prayer, in which a mystical aspiration now showed itself for the first time in Russia. Sergius was born to a noble family of Rostov, northwest of Moscow. The family later settled in Radonezh, but the young Sergius, after an encounter with a monk who opened his mind to the things of God, soon left home and settled himself in the solitudes of a forest. He built himself a chapel with a cell, but only became a monk through the intervention of a neighboring priest-monk, Abbot Metrophanes. At first Sergius lived entirely alone, in familiarity with wild beasts and taming a wild bear. Then companions joined him. Metrophanes had visited them more or less regularly, but when he died they forced Sergius to become Superior of the Lavra they had set up. In the end he had a vast monastery around him, with a church building dedicated to the Holy Trinity; and soon a village started to grow up around the monastery. Like Theodosius, Sergius applied, or tried to apply, a moderate rule. But as he also had Theodosius’s humility (he insisted on wearing rags, bringing endless contempt on his head, as no one could believe such an insignificant-looking man was a renowned Superior) as well as his concern for individual and collective poverty, he does not seem to have been any more successful in imposing authority on his monks. Finally, when his own brother entered the community and conspired against him, he withdrew into total solitude once more, until he was entreated to return. Yet his influence outside the monastery was extraordinary. The metropolitan of Moscow, Alexis, who was for some time regent of the Muscovite state, often employed him for political missions. Some of these concerned positive reconciliations between warring princes or cities. But others—foreshadowing a new conjunction between church and state—were not always so positive, as when he laid a city under an interdict because its prince refused to submit to Moscow. But his national glory was due primarily to the blessing and encouragement he gave to Prince Dmitri Donskoy on the eve of the first great Russian victory over the Tartars at the battle of Kulikovo (1380). However, if the Lavra of the Trinity was a charity center with social works more highly developed than those of many older monasteries, and even a center of national renewal it remained first and foremost a sanctuary for the most fervent prayer. We are not told that Sergius practiced any form of aseticism other than the most humble work and the most complete self-abnegation; but the fervor of his prayer is brought out by his biographer, manifested in certain luminous visions that surrounded his person (such as an angel concelebrating with him, or the radiance of the chalice he had just consecrated). At the end of his life he shut himself up in total silence. But, of this man of prayer and solitude—a solitude peopled with the crowds who flocked around him—it is an impression of radiant sweetness and matchless goodness that will endure. Despite what the modern Soviet government would like, Sergius’s grave is still the most frequented and the place of most fervent pilgrimage in all Russia, well outdrawing that of V.I. Lenin, the Soviet Union’s founder. These stories of spirituality among the Orthodox believers of the Russes come only from the period between 988 and 1450; a thousand more stories could be told from this same period, not to mention the years between 1450 and today. But these are in some sense representative. Of course, with the exception of Vladimir Monomach’s, these are stories of monastic spirituality, and largely leave unmentioned the spirituality of the laymen and women of the Russes. Yet these tales should be enough to demonstrate that—for Westerners at least—a vast, practically unknown treasure of spiritual exploration and discovery lies waiting to be found. Louis Bouyer was a priest of the Oratory in Paris, France, and a professor of spiritual theology at the Institut Catholique. A freguent contributor to French periodicals, he is widely known in the U.S. and Great Britain for his speaking and writing. His works translated into English include The Spirit and Forms of Protestantism; The Meaning of Sacred Scripture; Word, Church and Sacraments in Protestantism and Catholicism; and An Introduction to Spirituality.